I don't suppose very many readers need to know that Henry Purcell (1659-1695) was England's most accomplished and well rounded baroque-era composer, both prolific and profound. He was called upon often enough in his career to write music for the theater. The Aradia Ensemble has culled some extraordinary but rather obscure music written by him for such settings. Just now comes their second volume of it all, Theatre Music 2 (Naxos 8.573280), and a fine thing it is. Overtures, song, dances and some musically set dialog variously grace various works. We get a full selection from "The Married Beau," "Sir Anthony Love," and "The Old Bachelor," plus single songs from "The Spanish Friar" and "Aureng-Zebe." It is music of great charm, lyricism or jauntiness in turn, performed beautifully by the Aradia Ensemble under Kevin Mallon, with soloists soprano Johane Ansell and baritone Jason Nedecky in fine form. It is first-rate Purcell all the way and hoorah for Naxos and Aradia for bringing this music to us. I have not as yet heard volume one but I imagine it is equally compelling. 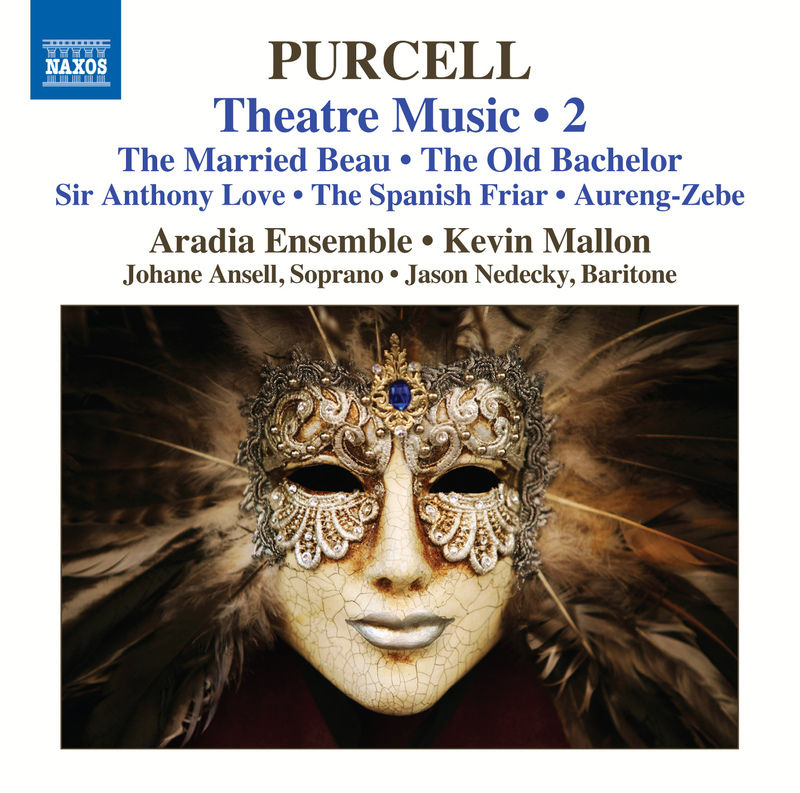 Anyone who loves the baroque performed well and authentically, anyone who appreciates Purcell or would like to know his music better can do no wrong with this volume. It is a treasure. I am in the process of moving and so will not be able to post for about a week. See you then! Ralph Vaughan Williams and Gustav Holst were English contemporaries, good friends and great admirers of each other's music. 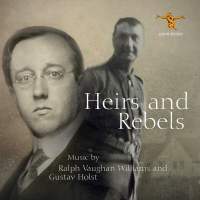 The album Heirs and Rebels (Albion ALBCD 027) intertwines the two composers via old recordings that show them with traditional roots and their own sometimes subtle early modern tendencies, and a pronounced affinity in how they incorporated traditional folk strains into their work. The label has nicely remastered recordings from the 78 RPM era, 16 short works in all, nine by Vaughan Williams, seven by Holst, running the gamut from songs, works for wind band or orchestra, choral works and Christmas carols, all showing folk and traditional roots and their own contemporary reworkings. What strikes one, besides the audio of the time, is how there are sounds that we rarely encounter today, the timbre of the wind band, the rapid vibrato of some of the solo vocals and a certain rootsiness that all seem far away in time for us now. So in that sense this was the music as it sounded then and one presumes the composers found to be right. That in itself is interesting. But beyond that these are charming examples of the miniatures both could craft so well, performed with spirit and zeal. This Albion recording was produced under the auspices of the Ralph Vaughan Williams Society. It is a very diverting program sure to appeal to lovers of Vaughan Williams, Holst and early modern musical Anglophiles. Recommended! The latest volume of Kaikhosru Sorabji (1892-1988) and his monumental 100 Transcendental Studies (Nos 72-83) (BIS 2223) is upon us. 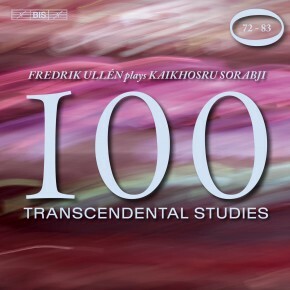 Eventually pianist Fredrik Ullen will be recording all 100 of the cycle. This latest installment gets us most of the way there. I've covered an earlier volume on these pages (look up the review in the index box if you would like to read that). My exposure continues here, I am happy to say. There is no easy way to characterize the cycle, except to say that it is phenomenally difficult music to play, that it has the DIY exploratory expression of Sorabji's piano music in evidence with all kinds of twists and turns, and that it is one of the 20th century's most daring and exhaustive cycles, a masterpiece of technical-expressionist modernism with some incredible rhythmic and melodic-harmonic complexities and a great variety of approaches that relate sometimes to one another, sometimes to other piano repertoire, and to a complete gamut of personalized style possibilities. 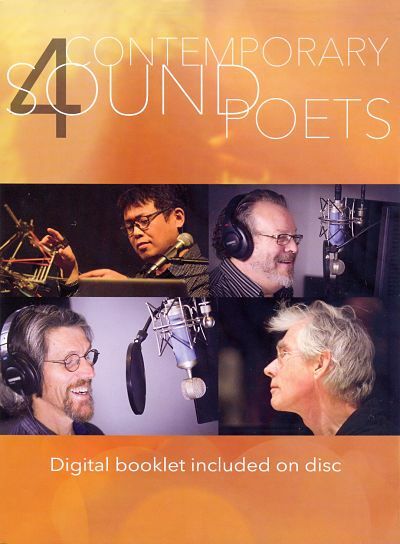 We get in this volume for example a theme with 100 variations (75), a perpetuum mobile (77), an impressionistic tone poem (78), a study in fourths (83) and a maelstrom of accentuated gestures set against a whirlwind of notes (82). All 100 were written between 1940 and 1944, but this is music that seems to go beyond time, embracing a kind of eccentric modernism that gives us a Sorabji for our present-day sensibilities, beyond his own time surely, yet also paradoxically filled with the gigantism-expression of the late romantic era and the ultra-progressivity that flourished then in spite of the social traumas that were ripping the world apart. Fredrick Ullen is a pianist endowed with the considerable technical acuity these works demand, but also the poetic imagination that is always key to Sorabji's music. He is the ultimate Sorabji interpreter, surely, or one of the primary ones at any rate. The superb performances match the daring and iconoclastic music one-for-one. These are thrilling works, played with fire and commitment. Should you get all 100? If you can swing it, based on the installments I have heard. Meanwhile this is a great volume to start with. Very highly recommended. Music is a container of meaningful sound. Modern solo piano music is a series of such containers, often filled with complex gestures, sonorities, timbres, tone syntax that in the best of circumstances speak to you in a language you understand but have not been privy to previously in quite this way. That is very true of Almeida Prado (1943-2010) and his "Cartas Celestes" series of piano pieces. 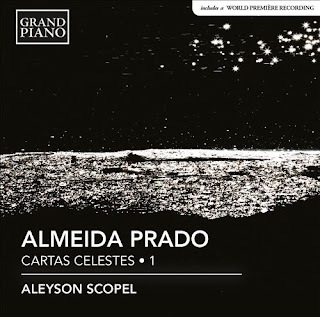 Aleyson Scopel has embarked on a recording of the complete cycle, with the Complete Cartas Celestes 1 (Grand Piano GP709) currently out as the inaugural volume. For this first offering we get Nos. 1, 2, 3 and the World Premiere recording of No. 15. It is a virtual musical mapping of the heavens and so understandably has a hugely open and expansive modernist feel to it all. Prado studied initially in Brazil with Guarnieri but then with Boulanger and Messiaen in Paris. The music has the rhythmic complexities of Messiaen, jaggedly asymmetrical, but also perhaps even more abstracted than typical of Messiaen, and less tied perhaps to melodic continuity at times. But then you might get a canonic contrapuntal passage that appears and gives us a brief glance backwards before venturing forth again into the remote stratospheres of relational sounds. All of the music exemplifies Prado's "transtonal" approach, which is neither quite tonal, atonal or bitonal but all at once, I suppose you could say. 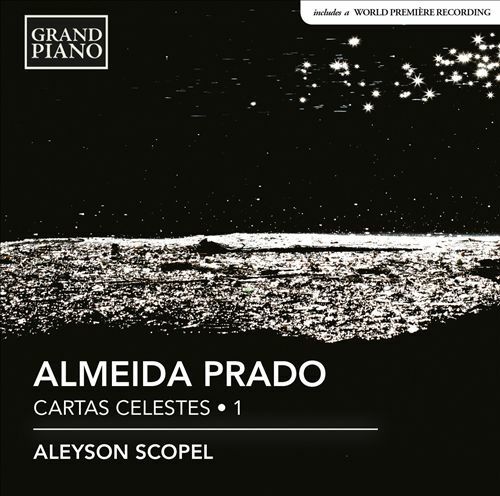 It is music of high modernist adventure, played impeccably and expressively by Aleyson Scopel. Volume one comes through with but four of what appears to be a monumental piano opus, ambitious and dramatic, singular and vividly gestural. I am much taken with the music and its performance. Any of you high modernist devotees out there will undoubtedly respond to this music, and may find yourself wanting to hear it all. Prado comes across as a major figure in the music, surely. Highly recommended. Thankfully the amassed choirs, soloists, and orchestra give us an exceedingly beautiful reading of the work. The music has a distinctly English feel to it--Vaughan Williams is somewhere lurking in the wings, perhaps. There is a kind of accessibility to its melodiousness that would perhaps fall a bit flat in lesser hands. The "Psalmfest" (1993) and the related shorter works "This is the Day" (2011), "Lord, Thou hast been our refuge" (2008), and "Psalm 150" (2002), all included here, are a joyful, ecstatic group of works that shine brightly thanks to the beautiful singing of the St Alban Choirs and the nicely articulated orchestral performances, and of course the poetic joy of the Psalms of David. This is not precisely modernist music, but it is music with a traditional 20th century lineage yet a contemporary rhapsodical feel. 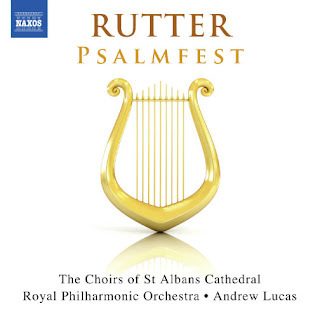 There is a kind of sureness, a mastery of the forces at hand that marks John Rutter as special. The music is very moving and I respond to these performances readily and most pleasurably. Anyone taken by the choral medium I believe will feel the same way. So I do heartily recommend this disk. Today, something out of the ordinary: a 5:1 surround disk with a lengthy program featuring 4 Contemporary Sound Poets (Pogus 21083-2). We hear the electroacoustic compositions of Tomomi Adachi, Jaap Blonk, Owen F. Smith and Duane Ingalls. All make excellent use of the surround medium (both AC3 and DTS are options, which will enable you to hear the full sound on virtually any DVD or Blu-Ray player). The human voice in its extended sound making possibilities is at the center of most works. Avant vocal execution and electroacoustic transformations are the order of the day. All the works presented are cutting-edge contemporary avant, ranging from collaged density to soundscaped ambient. Experiencing them in 5:1 audio staging is sometimes quite exciting and alway revelatory. Keep in mind that the visual component on the disk is functional--you get some photos with the menu choices, but the works are presented with a nearly blank screen (with a thin stripe of color arranged across the top). That is all fine--this is an audio disk and you are there to listen. Like all avant new music you may find yourself liking some works more than others, but that is a personal thing. Each work is its own adventure and has the ring of authenticity and newness about it. I found the experience riveting. I believe all you who embrace the high modern-postmodern camp will find it all fascinating. And the surround sound is fantastic throughout. Highly recommended for the adventurists out there! The catastrophic upheavals that marked Germany's invasion of Russia during World War II led to some of the most memorable symphonies of that era. There is Prokofiev's turbulent Symphony No. 5, Shostakovitch's markedly dramatic Symphony No. 7, and not as well known, Khachaturian's Symphony No. 2 "The Bell". The Russian Philharmonic Orchestra under Dmitry Yablonsky gives us a stirring reading of that symphony in a recent recording (Naxos 8.570436) and I have been listening to with pleasure. Khachaturian (1903-1978) describes the symphony as a "requiem of wrath, a requiem of protest against war and violence" (liners). The nickname of the symphony derives from its tubular bell part that enters the matrix several times during the work. It is, given the subject matter, very expressive and unsettled music, with much dramatic impact, certainly worthy of taking its place with the Shostakovitch and Prokofiev symphonies of the period, though with perhaps not quite the thematic brilliance of the others. Nonetheless it is a completely satisfying work, an extroverted dirge that cries out in protest with the full resources of the modern orchestra. A bonus on this disk are several excerpts from Khachaturian's "Lermontov Suite" (1959), which he initially wrote as incidental music for Boris Lavrenyov's play about the playwright-poet in 1954. It is perhaps not quite at the level of the symphony, but nonetheless gives us some good moments and does not detract from the overall effect and high level of performance on the program as a whole. Russian modern aficionados will doubtless want to savor this fine recording of a somewhat neglected symphony. It is very worthwhile. Kudos to Yablonsky and the Russian Philharmonic. Sergey Rachmaninov (1873-1943) did so much to extend and personalize late-romantic Russian expressionism that one listens and ignores the reality that his style in his later years was firmly anachronistic. Most of his piano solo and all the concerto oeuvre require exceptional virtuosity and poetic interpretive brilliance from the soloist for it all to come through properly--and a really worthwhile performance puts the music in a nearly timeless realm. So it really doesn't matter that Rachmaninov was in the end not completely of his era. This is very much true of the solo piano blockbusters Etudes-tableaux, Op. 39 (1896) and the Moments musicaux, Op. 16 (1916-17). It is difficult to do the works justice, but we find an ideal exponent in Boris Giltburg, who has recently recorded both in a fine new release (Naxos 8.573469). Both demand torrential outpourings of melodic-harmonic dynamics, motor-sensory finesse of the highest sort, complete control over the widely contrasting passages, an intelligent and musical use of rubato and a climactic sense of impassioned pianism. There are one might presume many who can make of the music something comprehensible, but very few who can take it to the highest level of exultation, to give it a liquidity of flow, to bring out the widely expansive arcs that the composer envisioned, the shifting moods and colors of each movement. Boris Giltburg is one of those few. He gives us a tremendously exciting take on both works. He clearly was made for this music. And the music itself in all its profundity and Russo-dash becomes clear to us, with the deeper inner meanings coming forth out of the extraordinary virtuosity. 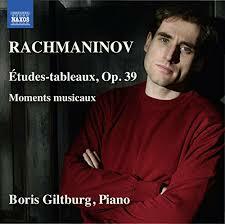 Giltburg triumphs and thanks to him so does Rachmaninov. For all those who have had their doubts about the brilliance of these works, seek no further. Boris lays it all out for us, gives us a Rachmaninov we ordinarily do not get to hear, not like this. Highly recommended. 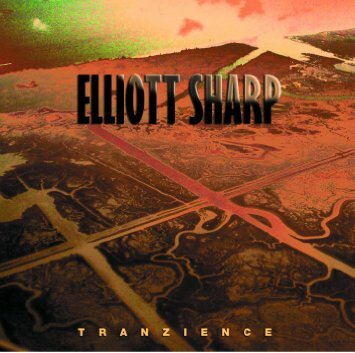 The artistic mastery of Elliott Sharp over his long career has taken primarily three shapes: as an innovative guitarist in blues rock (Terraplane) and avant jazz contexts, as a jazz composer-bandleader, and as a new music composer. Today's CD, Tranzience (New World Records 80778-2), concentrates on the latter, with four compositions that show Sharp's innate brilliance in realizing significant form in original and aurally captivating sound sculptures. Each work was fashioned for a specific chamber configuration: "Tranzience" (2013) for the JACK String Quartet, "Approaching the Arches of Corti" (1997) for the New Thread Quartet of soprano saxophones, "Homage Leroy Jenkins" (2008) for clarinet, violin and piano, and "Venus & Jupiter" (2012) for the chamber ensemble Either/or with Elliott on electroacoustic guitar. A great deal could be said of each work. The liners, written by Anthony Coleman following an interview with Sharp, touch on some salient aspects of the works presented. The "low throb" is one aspect--from its presence in bodily rhythms, to its transformations in the form of "dronalities" that morph and become multiple discrete pulses and/or a single organizing pulse to which everything relates. Another aspect of his music relates to the dichotomies and oppositions between pulse and contrasting explosive disruptions and noise, a vividly bipolar set of tendencies that have played out between and against the Downtown Music minimalist composers and the Downtown avant improvisational artists. Sharp has tended to be associated with the latter artists yet his music includes both aesthetic polarities. The new music composition of his mature phase goes beyond improvisations per se but does not feel a one-to-one affinity with typical compositional trends either. The influence of Fractal Geometry, the Fibonacci sequence and other mathematical perspectives inform his music but the decaying industrial dystopia and the idea of disruption play a balancing act in his music as a whole as well. Elaborate order and expressively intentional chaos join hands and are part of the same impetus, you might say. All these considerations and more play themselves out in varying ways in the four compositions that make up the album. Neither the organizing principals nor their intentional disruption are the point of this music in the end, it goes without saying. It is the play of musical-intentional multiplicities that Elliott Sharp's musical inventions adhere to and overcome, and the sheer sonic beauty of the multiform expressed in personal terms ultimately holds sway with our committed listening beings. And for that the performers and Elliott's varied compositional dialogues are in the end irresistibly melded into a music of aural significance that we enter into readily and willingly. That is to say that anyone who embraces the modern, advanced zeitgeist should find the music bracing and pleasureably stimulating, intelligent yet cathartic, articulate yet wholistically driven, brilliant yet refusing to stay put. In other words, this is music of the modern now by a composer-artist of great importance to the now in which we live. I was lucky when young to come across a Nonesuch LP that included one of Ben Johnston's String Quartets--No. 2 as performed nicely by the Composers Quartet. I still have that album and it continues to make an impression on me as like nothing else I had heard at the time, or since. Until now. Happily the Kepler Quartet is recording Johnston's complete cycle of quartets. I have a copy of the final installment, String Quartets Nos. 6, 7 & 8 (New World 80730-2) and I must say I am enthralled with it. Quartets 6-8 cover 1980-86 and show us a maturity and inventive sophistication that can only be described as phenomenal. Johnston's working with microtonal and untempered tunings continues. The directly communicative melodic-harmonic elements ground us in a readily grasped way, yet the intervallic alterations lead us into an uncanny realm where all has shifted. Once one adjusts to the mathematical reapportioning of the pitches one experiences something very ear-boggling, enlightening. The perpetuum mobile presentations of the slower movements--"Variations" from the Seventh, "Lazy, rocking" from the Eighth, and the entire single movement "Legato espressivo" that comprises the Sixth are most remarkable, lyrical yet bitingly intoned as if from another world. That is not to say that the other movements are in any way extraneous--they have contrastive impact and excitement. And taking all three quartets as a listening whole they flow exceedingly well, brilliantly. A bonus is the hauntingly terse "Quietness," a short work from 1996 with a very moving poetic recitation and quartet accompaniment in honor of the passing of composer Salvatore Martirano. The Kepler Quartet no doubt did considerable rehearsal time getting the tunings exact and the phrasings just right--and if you have a good ear you hear the logic and precision of the tunings and get an extremely expressive, ideal set of performances. All kudos to the Kepler Quartet. This is a landmark recording of music extraordinarily advanced and yet with a kind of straightforward avant lyricism that is unforgettable. I can't wait to catch up with the Kepler versions of the other quartets. This disk alone is absolutely essential in itself though. Get it and listen closely if you can! The "What's new?" factor is foremost on the recent 2-CD set Miniaturised Concertos, Mache (Metier msv 77205), which features works for two pianos, chamber ensemble and electroacoustics. The musical director is Kate Halsall and she has done a fine job coming up with exciting new music and guiding the live performances to a satisfying fruition. The Miniaturized Concertos disk spotlights the twin piano/keys of Kate herself and Fumiko Miyachi performing works by Andrew Poppy (with chamber ensemble) Naomi Pinnock (with percussion), Philip Cashian (with chamber ensemble), and Colin Riley (with electronics and sound design). This is new-minimalism and post-minimalism in a most original and healthy steady-state. 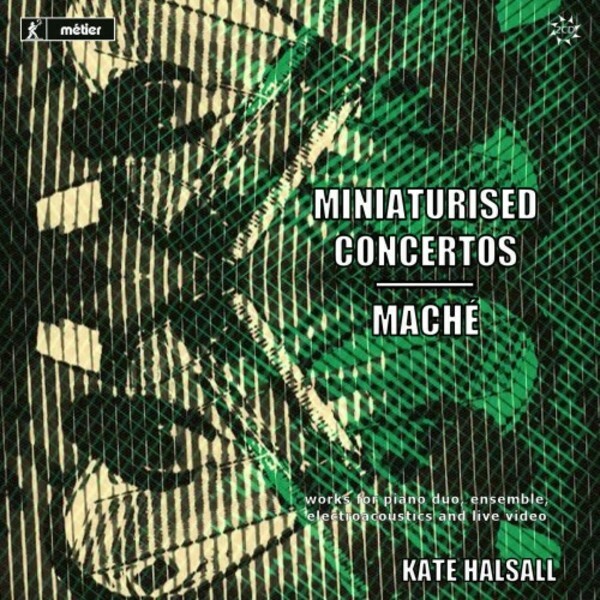 The second disk, Mache, utilizes multiple piano and keys by Halsall, Miyachi, and others as well as additional instruments, vocals and natural or electronic sounds in the collaging of pre-existing or specially devised compositions and their transformations. Kate and James Waterworth are responsible for the sound design and collages. The results are stunning. Seventeen composers and their works are subjected to recombinatory logic in four Mache segments. The composers involved are, for the record, Ryoko Akama, Joel Bell, Leo Chadburn, Richard Glover, Duncan McLeod, Fumiko Miyachi, Andrew Morgan, Dominic Murcott, Helen Papaioannou, Richard Perks, Emma Ruth Richards, Matthew Rowan, Rowland Sutherland, Timo Tuhkanen, Simon Vincent, Ruta Vitkauskaite and Devon Tipp. The musical soundscapes-panoramas give us a sort of state-of-the-art window on ultra-post-modern-modern worlds. It makes for a beautiful listen. This set breaks ground and stimulates the musical ears in rather profound ways. I do not hesitate to recommend it highly. An essential offering for what, indeed, is new out there right now. 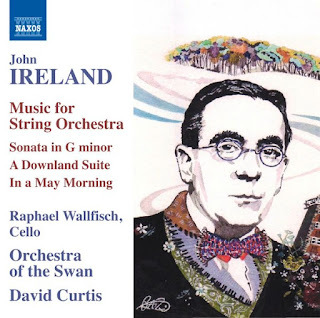 John Ireland (1879-1962) is not exactly a household name, and perhaps more's the pity? He doesn't seem fated to enter the pantheon of immortals, yet as a leading English impressionist he gave us some substantial fare. His Music for String Orchestra (Naxos 8.571372) is a case in point, though I have not heard any of it until now and this welcome release. His music in the eight pieces represented makes a case not for Ireland as the English Debussy or Ravel, but a composer in the impressionist-rhapsodic lineage of the Vaughan Williams of "A Lark Ascending" or Frederick Delius. The music presented here was originally written for solo piano, cello and piano, violin and piano and brass band. With the exception of the two middle movements of "A Downland Suite" all of these works were orchestrated by others, yet the lyrical effusiveness of the original music comes through readily and consistently. The performances are respectable, as is the recording quality. Raphael Wallfisch sounds well on the solo cello parts. I could imagine Boult or the like doing a state-of-the-art version of these works but since all but one short piece enjoy their world premiere recordings here in orchestral form, this is our sole option. Most certainly we get a vivid sound picture of the music in these David Curtis versions. Modern period Anglophiles will find this album a good addition. The music will appeal to those who appreciate an impressionist coloration. They do not have the power to topple the existing hierarchy of "masterworks," but then what does? A most pleasant listen. Paula Diehl? A living modern composer whose music has a signature originality. Her two-CD offering Separation: Works for Large and Small Ensemble From 1982-2015 (Navona NV 6044) affords us a bird's-eye retrospective of her orchestral and chamber music thus far. Six orchestral works comprise the first disk; seven chamber works are programmed on the second. All share a stylistic unity that is what Ms. Diehl is all about. The music tends to follow a sort of periodicity that in its most simple expression comes to us in the form of long-note-long-note-rest, repeat and develop. That basic rhythmic model with many evolved variants and permutations are a key part of her musical vocabulary. As I listened I mulled over where I might have heard similar phrase structures before, and eventually recalled that some of Stravinsky's neo-classical works had segments that operated with a similar sort of musical Morse code now and again. 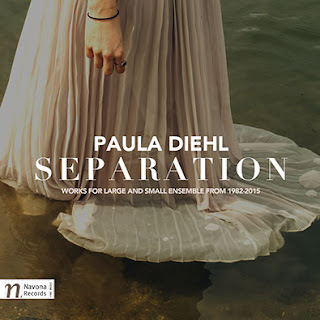 What is key though is that Paula Diehl makes of this way of phrasing a major organizing principle and takes its simple sound-sound-silence very far in original and ever-varying ways. It may indeed have something to do with the CD set's title Separation, though the liners tell us that it was the name she gave to the composition system she devised while a student at American University in 1978. Nonetheless the key periodic short silences do indeed serve to separate formally and concretely phrase-from-phrase. This is an interesting question, but ultimately what matters is the music, which has considerable modernist thrust and ingenuity. Every work presented in the set has its own integrity and stands out as one experiences it a few times. The orchestral disk affords us four strictly orchestral works and two for chorus and organ. The chamber disk gives us two chamber orchestra works, two for baritone and piano, a quartet, a solo piano work and a duet for piano and organ. The various artists involved come through with performances that do full justice to the musical complexities involved. And in the end you feel that you understand and appreciate just how vibrantly singular this music is--or at least I did. Paula Diehl must be heard and listened to deeply to be appreciated. She is, as it turns out, an important modern voice whose clearly articulated and beautifully inventive ways mark her as a major contributor to new music, as indeed very much new in her approach and major in the sublimity and creative expression of her vision. Like Morton Feldman she has her own independent personality that both fits in with the stream of modernism of today yet remains apart and stirringly individual. The set brings me a great deal of pleasure. I think it will do the same for anyone who appreciates the modern world of musical possibilities. I highly recommend it to you. 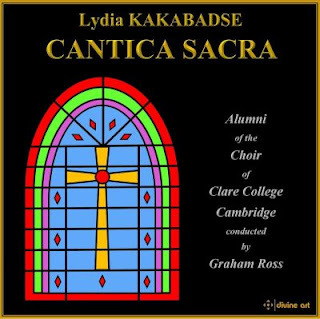 Contemporary modern composer Lydia Kakabadse brings to us a vision of sacred music that incorporates archaic influences from chant and early polyphony in four sacred works for choir and soloists (plus chamber instruments for the initial work). 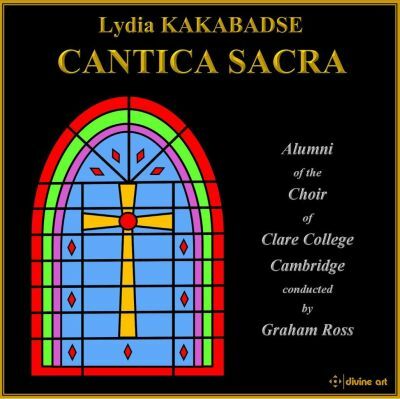 Canta Sacra (Divine Art dda 25135) is performed with authentic flair by the Alumni of the Choir of Clare College Cambridge conducted by Graham Ross. Anyone who appreciates the early music "old-in-the-new" approach of Arvo Part and others who follow in his wake will find these four works quite different yet genetically related and compelling in their own way. The opening work "Spectre of the Maiden Scorned" uses the Requiem Mass as the basis for a story of a monk, the woman he loves and those who attempt to prevent their elopement. It is haunting and highly memorable. The three other items on the program utilize a choir of unaccompanied male voices for a series of new works that take on chant, organum and post-organum styles in nicely wrought recreations. The Liturgical Cycle "Cantica Sacred," the Lenten Hymns "Kontakia" and the Marian Hymns "Theotokia" give us a genuinely inspired vision of early sacred music with a movingly original modern flair that takes you back many centuries yet de facto and in its encompassing totality belongs to our contemporary present. Lydia Kakabadse is a phenomena and a virtual reincarnation of an early music master. Her music is impressively singular. Graham Ross, the Alumni Choir and all the rest give us wonderfully mysterious and detailed performances that one does not forget after several hearings. Anyone who revels in early sacred music will find this program surprising and very worthwhile. 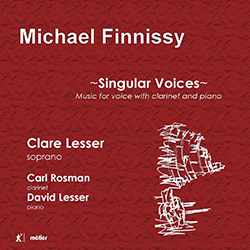 From the extensive series of Michael Finnissy offerings on Metier comes a recent release of vocal music, Singular Voices (Metier msv 28557). It is a grouping of high modernist song that incorporates folk-like elements in its attention to song form--which may take a few listens to grasp but is present in subtle ways. It features the remarkable virtuoso soprano performances of Clare Lesser. It is understandably for Finnissy very much in the grand tradition of modern song in the post-Webernian mode, but originally his own nonetheless. Ms. Lesser holds forth unaccompanied, with piano and/or with clarinet, with David Lesser on the former and Carl Rosman on the latter. This is difficult music from a performance standpoint and all three do an excellent job realizing the complexities. It is demanding music on all fronts. Those who are familiar with the jagged rhythmic soundstaging, the expanded and post-tonal rootedness and widely spaced intervallic acrobatics of much of high modern song will readily take to the myriad complexities of these works. Others may find it necessary to adjust the expectations and zero in on the sensuous properties of the music. It is a testament to the highly musical sophistication of Ms. Lesser and her colleagues that all comes off exceedingly well. It is a showcase for Michael Finnissy's singular vision of the ultra-modern possibilities he realizes with such artistry. Confirmed modernists will rejoice! Sound adventurers will find this a very worthy challenge. It has helped me become a Finnissy adherent. Beautiful music if you adjust to its very expressive world! Beethoven's influence ended up being as huge as anyone's in the history of classical music. His approach to the pianoforte influenced virtually all who followed, and not just in the music itself, but in the development of a singing tone. 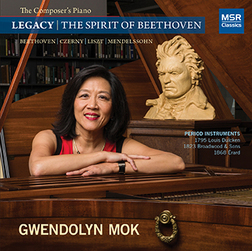 Gwendolyn Mok makes use of three beautiful sounding period pianos (a 1795 Louis Dulcken, an 1823 Broadwood and Sons, and an 1868 Erard) to address the Beethoven influence, first Beethoven himself, then his pupil Carl Czerny, a Franz Liszt transcription and a characteristic Felix Mendelssohn work. The program starts with Beethoven's breakthrough "Pianoforte Sonata No. 2 in A Major, Op. 2, No. 2" of 1795. It all starts here and it all follows through from the initial impetus. Carl Czerny in turn taught Franz Liszt and instilled in him an adoration of Beethoven's piano legacy. Felix Mendelssohn knew both Czerny and Liszt and like them was under the spell of Beethoven from the beginning. We get that connection both directly and indirectly through a number of well-chosen works: Czerny's "Erste fantasie auf motive aus Beethovens werken" (1835), where Czerny utilizes themes from eight Beethoven opuses and weaves a fantasy around them. His 1841 "Nocturne in E-Flat Major, Op. 647" shows the mature composer and what the singing legato style meant to him. Franz Liszt's arrangement-transcription of Beethoven's song cycle "An die ferne Geliebte" stays close to the Beethoven piano parts but then adds the vocal part and additional flourishes. A volume of tributes to the master, Album-Beethoven, included 11 composers and was published in 1841. Czerny's "Nocturne" was among the highlights, as was Mendelssohn's "Variations Serieuses in D minor, Op. 54." It is a fitting conclusion to a program that literally glows with Beethoven's presence. The period pianos and Gwendolyn Mok's subtle reading of them give us a Beethoven and an early romantic way that remains connected to its classical roots, shows a beautifully singing style without the excessive rubato or emotional blindsiding that 20th century performances sometimes strayed into. All the works meld together as an impressive, privileged ear-side view of what indeed the early period of Beethoven's legacy sounded like. Hearing the original pianos reminds us that this music was neither commandingly loud at its extreme end, nor are the voicings balanced in the typical ways that the modern pianoforte encourages and even requires. There is a blend of registers but a distinct heterodox multivoiced timbral quality, too. You hear a different kind of balance as you listen to Ms. Mok and the piano responses. It is like hearing the music anew. It is a joy of an album, a triumph for Gwendolyn Mok and the repertoire as well. Beethoven no doubt would have loved this disk! Highly recommended. The Wind Band or Symphonic Wind Ensemble of course has over the years developed its own repertoire. There are some wonderful pieces out there. The Eastman School of music gave us some classics in recorded form in the later '50s, but there have not been quite as many albums as one might have wished following that period. 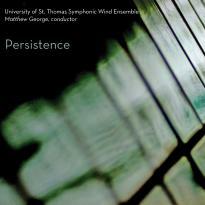 As if to make up for the comparative lack, the University of St. Thomas Symphonic Wind Ensemble under Matthew George gives us a substantial 3-CD set of contemporary works on Persistence (Innova 812:3-CD). They are a high-spirited and quite competent outfit and George has made a point of following an ambitious program of premieres by contemporary composers, ten works in all in respectable to very good performances. Suffice to say that this is in the tonal modern camp, that there is a great deal of latitude in the stylistic approaches represented, and that there is much to intrigue. The three disks cover "December Dance," by Andrew Boysen, Jr., "Concertino for Wind Ensemble" by Ralph Hultgren, "How Very Close" by Dana Wilson with Carrie Henneman Shaw as solo vocalist, "Mata Hari, Three Symphonic Scenes for Concert Band" by Nigel Clarke, "Desi Jhalak" by Shamir Tandon, "Suite No. 4 for Band" by Victoriano Valencia Rincon, "Lights From the Yellow Star: Music of Sorrow and Love" by Boris Pigovat with Casy (Johnson) Barker as vocalist, "Duende, Four Preludes for Symphonic Wind Ensemble" by Luis Serrano Alarcon, "Oneiric Discourse, Concertante for Tenor Saxophone and Symphonic Wind Ensemble" by Jesus Santandreu, and finally "Dali" by Aldo Raphael Forte. These are well-crafted, truly symphonic additions to the repertoire. There is much to appreciate for the wind band enthusiast and at the same time the set gives us a survey, an encapsulation of new music possibilities in the middle tonal realm. It is well done and consistently engaging. Thank you Matthew George! A dedicated enthusiast tends to hear music a work or a discreet group of works at a time (except perhaps with HPSCHD or some other of Cage's combined works). And so it goes throughout life. Each day or week brings yet more music. Sometimes what's new is a continuation of what you already know; other times it is a significant rupture in the fabric of continuity. 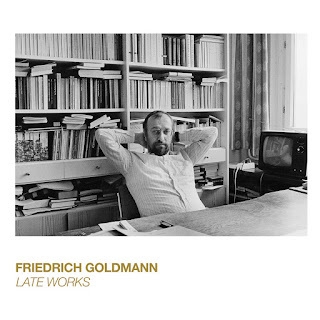 Being happily provided the chance to hear the music of Friedrich Goldmann (1941-2009) in the last month or so has been something of a rupture or breakthrough for me. Here is an important high-modernist exponent, a pupil of Stockhausen, a force for the new and in spite of all my musical explorations I have missed him. But not now. I was happy to speak of an exciting release of his music a few weeks ago (see the chronological table via the blog contents column on the right). And today I am back with another excellent anthology CD, Late Works (Macro M24). It covers a spectrum of offerings from an intimate duo to an orchestral piece, altogether giving us a nicely synoptic picture of Goldmann's later style. So in that we hear a composer who has worked his way through his own take on Darmstadt and like other similar brilliances of that school has used compositional method as a Wittgensteinian ladder to advance into works with a pointed sense of ultramodern sound color and post-harmonic pan-and-post-tonal all-inclusiveness that gains from the grasp of structure one absorbs from working in serialist modes. If all goes well it allows the creative and intuitive composer to extend the high-modern legacy into the creative present. We surely can hear that on this album. For all that we experience a composer who has gained a surety of means and a sensitivity to instrumental possibilities that is remarkable, that holds his own with the most well-known high modernists in their later phases. The four works heard here each has a great deal to offer, one in studio recording, the rest live in concert, all played inspiringly well. "Haiku a 6" opens the program. The Modern Art Sextet gives us an expressive reading of the work, which is filled with finely etched musical detail, brilliant use of sonarities and mysterious juxtapositions of sustained and shifting tone clusters. Its sound base is logically extended in the larger chamber group piece "Ensemblekonzert 3," played by musikFabrik with care under the direction of Enno Poppe. It is a fantasia based on the fundamental notes of an arioso from Bach's St. Matthew Passion. The delicately orchestrated gossamer-like transparency of the music shows Goldmann's brilliantly lively and unparalleled way with the waves of contrastively startling instrumental groupings. The violin-cello duet "Sisyphos zu zweit" gives us a freshening of contrast, a dramatic motor-sensory interjection before we launch into the landmark orchestral opus "Wege Gewirr Ausblick." Ekkehard Klemm and the Orchestra of Hochschule fur Music "Carl Maria von Weber" Dresden are fully rehearsed and marvelously attuned to the ever-shifting fantasmagoria of brightly conceived color textures. It is a fitting conclusion to the program, a tour de force of invention and orchestration. 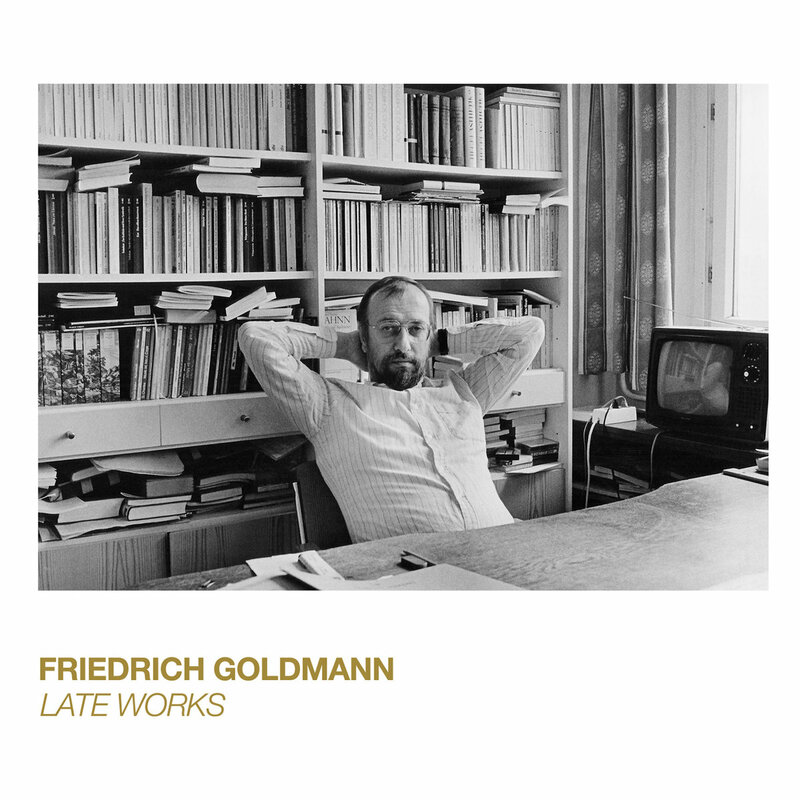 And so we get the chance to hear some of Goldmann's later gems, beautifully performed, brilliantly revealing a high-modern original at his peak powers. Anyone interested in the modern period should hear this. It is essential, a real discovery for those who do not know Goldmann's music well, and no doubt a confirmation for those that do. The concerto for classical guitar and orchestra became more widespread in the 20th century, with classic works that established the genre as a specially expressive vehicle in its own right. 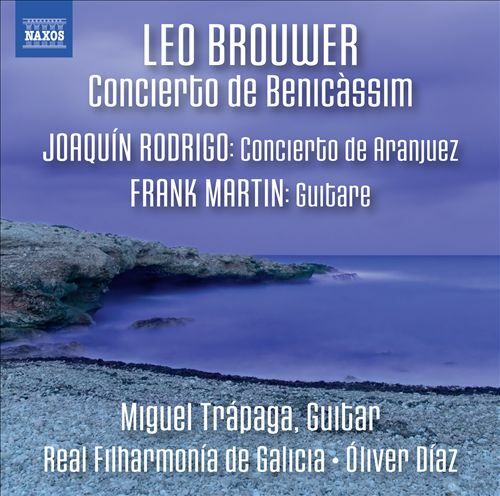 Today we hear guitar soloist Miguel Trapaga with the Real Filharmonia de Galicia under Oliver Diaz in a memorable program of three modern pieces, two concertos and an orchestrated version of a guitar suite, centered around the World Premiere recording of Leo Brouwer's 2002 opus Concierto de Benicassim (Naxos 8.573542). The Brouwer concerto is everything one might hope for--sometimes folk-like, expressive, progressive, modern in its core yet tonally lyrical, excellently orchestrated and sporting a touchingly memorable and virtuoso solo part. It is performed with the dreamily atmospheric potential and dynamic drama of the music out front. The Lento second movement stands out in balladic expressive fashion, mysterious and panoramic; the outer movements are bracing and filled with twists and turns that remind us just how accomplished and original Brouwer has become over the years. Swiss composer Frank Martin (1890-1974) is a somewhat neglected composer today. He deserves greater exposure as a stylist who followed his own muse regardless of the passing fashions of his lifetime. His "Guitare" from 1934 enjoys its World Premiere performance here, incredibly. It is the orchestrated version of his "Quatre pieces brevis" for solo guitar. It is dynamically neo-classically modern sounding, replete with a Spanish tinge at times, inventive and substantial. Along with the Brouwer it is especially fine to now have the work to hear in recorded form, as it glows in its own way with a freshness that seems as current as ever. Buoyantly luminescent, lightheartedly joyous in the outer movements, plaintively tender in the inner, Rodrigo's seminal "Concierto de Araquez" (1934) gets it due to put a capstone on the program. There may perhaps be more spectacular versions out there but Trapaga and the Real Filharmonia de Galacia with Diaz at the helm give us a stirring version here that leaves nothing to be desired. The disk leaps forth into our listening space with very well burnished, dedicatedly authentic performances of the three works. 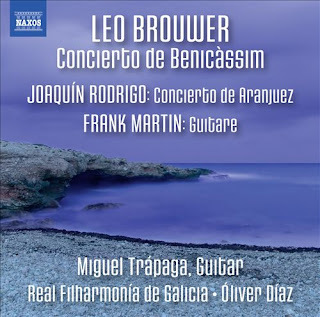 The Brouwer is a revelation, the Martin a nice surprise and the Rodrigo a heartening confirmation that Miguel Trapaga, Oliver Diaz and the Real Filharmonia de Galicia thrive with alternating bravura and introspection as the scores demand. In the process they draw us into each work with a care and dedication that is a pleasure to experience. The Brouwer work alone is worth the modest Naxos price. The Martin enriches us further. And the Rodrigo gets the sort of poetic reading that is hard to resist. Bravo! What might have been too complex and involved in the analog era can be possible in the digital age. Composer-performer Joseph Bertolozzi began with a dream, a rather outlandish one, which in the digital recording-editing world was feasible, if nevertheless quite daunting. What if he could turn the Eiffel Tower into a gigantic musical instrument? A metalophonic orchestra? The edifice is constructed of many variously resonant parts. What if he sampled each accessible metal surface with various striking devices, from variously tipped mallets to large blocks of wood? Could the results be digitally sequenced into some kind of cohesive music? 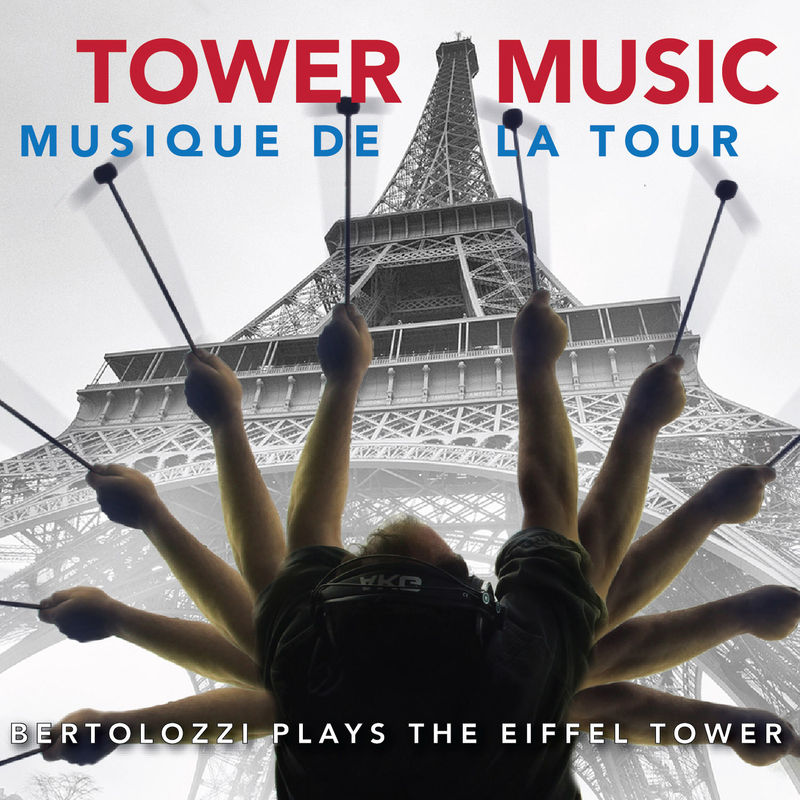 The answer is a resounding yes as we can readily hear on the resultant CD Tower Music, Musique de la Tour, Bertolozzi Plays the Eiffel Tower (Innova 933). The initial sound sample gathering was complicated enough. Bertolozzi, armed with an array of striking objects, a recording engineer with a portable digital recorder and contact microphones, and several assistants to help document the source of each sound and whatnot began exploring virtually every accessible section of the tower, finding a diverse set of resonant metallic surfaces which Bertolozzi experimented with, finding one or more suitable percussive sounds which were then recorded (sampled) and filed away for later reference and use. Once the team had more or less exhausted the possibilities, Bertolozzi retreated to his digital workstation. He began to group the individual sounds according to sound classes, in effect assembling a series of instruments, their natural scalar components classified together as raw materials for the compositional segments Bertolozzi later painstakingly assembled by sequencing melodic, rhythmic and timbre class sounds, in effect constructing the melodic-rhythmic particularities as he "orchestrated" them. The result is a series of movements for the Eiffel Tower as a complex orchestra of metallic sound-instruments. Of course all this would have remained merely interesting if the musical imagination of Maestro Bertolozzi and the technically demanding construction of the music via meticulous editing were not quite up to the challenges involved. No fear. It turns out that the nine segments of music presented on the disc are all beautifully conceived and realized, an acoustic-electric maze of beautiful sounds and stirring melodic-rhythmic singularities. Occasionally one is reminded of gamelan music, the music of Harry Partch, various classic percussion works composed for conventional instruments, and even John Cage's prepared piano pieces. But these are merely reference points on the way to some exciting original music. In the end your ears take over, hearing a totality of orchestrated sound rather than the discrete elements that made up the finished whole. But one is never totally unaware of course of the incredibly musical sounds that Bertolozzi found the Eiffel Tower capable of, so in effect you listen with two musical minds. It is a remarkable achievement and a wonderful listen to boot. It is a seminal example of what can be done today electro-acoustically, given the tremendous amount of labor entailed and the lively musical mind of the composer. This needless to say is music you should hear. It is infectiously rhythmic and exotic in ways virtually anyone would appreciate. Rather amazing, this.